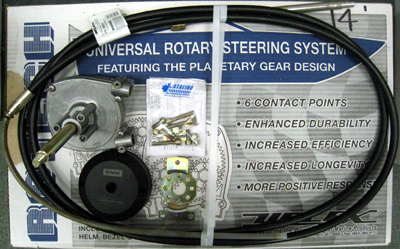 Steering Systems: 141010T-18 - Rotech complete with Helm, Planetary Gear Style, 18 ft. from California Marine. Quick Response Rotary "Rotech" Ultraflex Complete With Helm, Cable, & Universal Dash Mount Kit. Description Rotech complete with Helm, Planetary Gear Style, 18 ft.